Many people have visited the form templates gallery and used one of the form templates to get their job done. Others want to share their forms with the world and contribute to the JotForm community. Please make sure that you visit the Form Templates page. 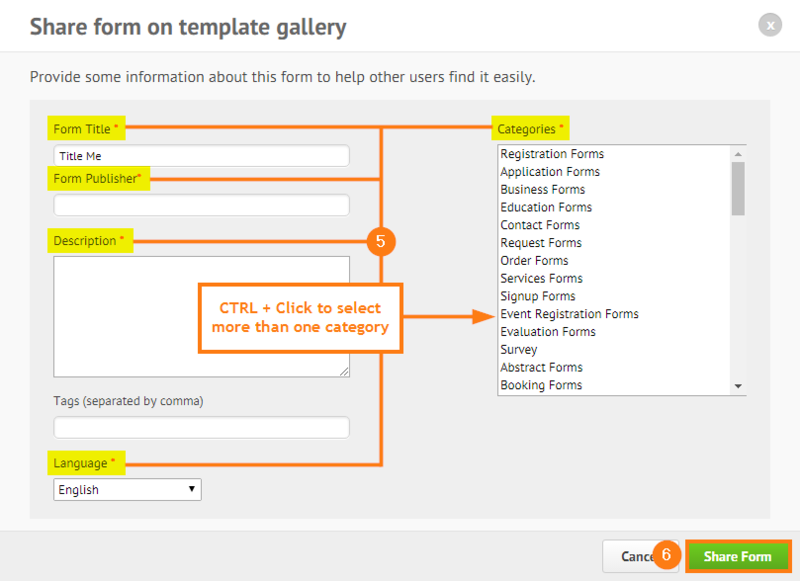 If you’d like to know how to share your form in the form templates gallery, follow the instructions below. 2. Select the form you wanted to share as a template. 3. Click MORE ▼ to show more options. 4. Then click SHARE AS TEMPLATE. 5. A modal popup will appear where you need to fill out details about the template you're sharing. You may choose more than one category for the same form by using the CTRL key on PC or ⌘ key on MAC. 6. Click the SHARE FORM button and you're done. 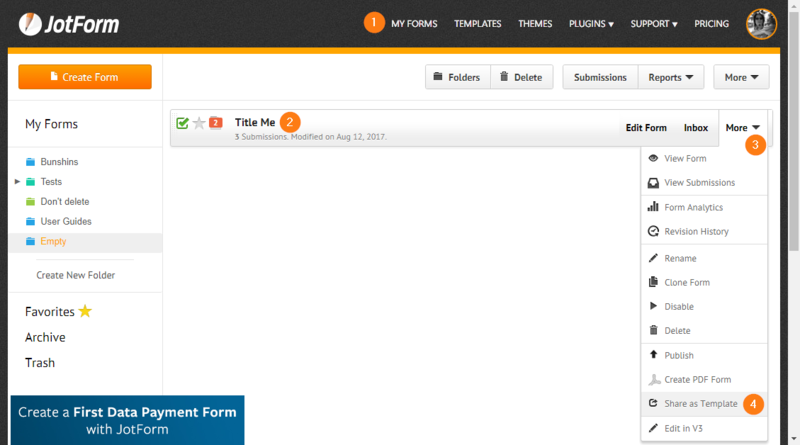 Congratulations and thank you sharing your form in the Form Templates Gallery! 1. 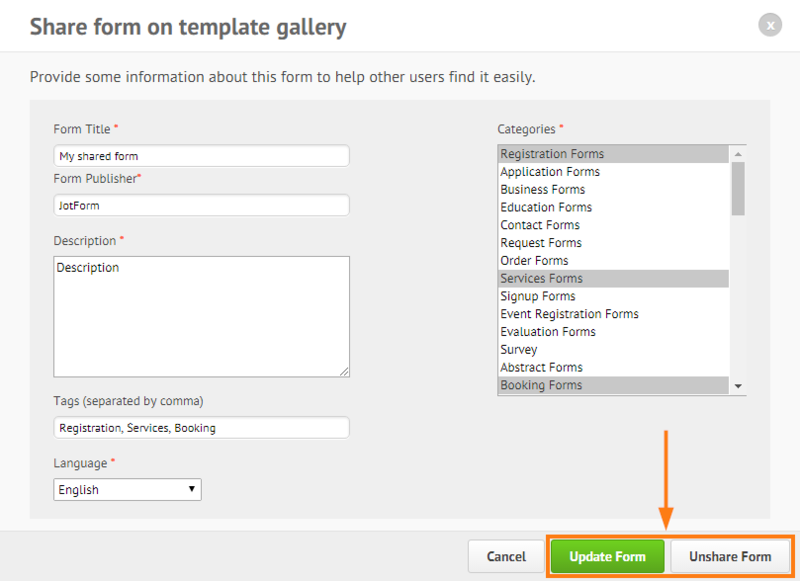 On the MY FORMS page, select the form you shared > click MORE ▼ > then SHARE AS TEMPLATE. 2. Within the same modal popup, make your changes accordingly then click UPDATE FORM. 3. Otherwise, click the UNSHARE FORM button if you wish to unshare it. If you had any difficulties in sharing your form or in using the templates gallery, please add a comment below or ask your question in our forum. Can you please delete this template shared by me? It doesn’t give me the option to Unshare form when I went to follow those process. It only gives me the option to share it as a template. I can't seem to find this in the list of templates even though I have followed these steps? If i delete my form to add more room in my forms, will they delete also from the template database? I have three forms that I accidentally shared as templates. I've tried to remove them using the above links, but they don't allow me to un-publish. Ideas? I followed the steps above, but my form only stays in the Templates Gallery for about a day, then seems to drop off. I have to keep repeating the process so that it stays up. Am I doing something wrong? When you share a form as as a template do your email notifications get removed? Can you UN-share a form if you shared it on accident? Or if you made a mistake and want to re-share a newer version? How can I insert all my text in a database? Do you have an incubation application form? can i create a form that other users of my account cannot view? if so how? How do I widen my checkbox column?